Front makes it easy to customize what’s displayed in your individual and team workspace. You can change what your counters show, pin tags for quick access, and show/hide inboxes and teammates. In your individual workspace titled Me on the top left corner, click on the Workspace options icon (the three horizontal lines). 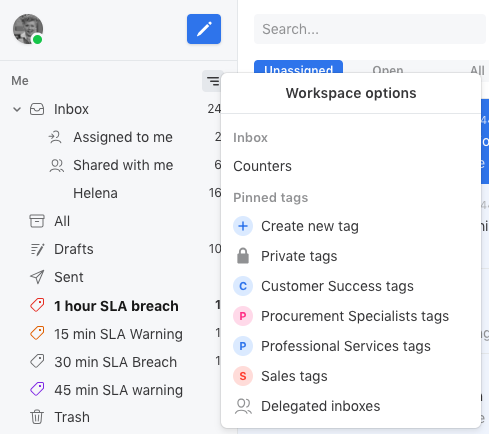 You will see the options for what you can view in your workspace, including counters, your private tags, team tags, and delegated inboxes. 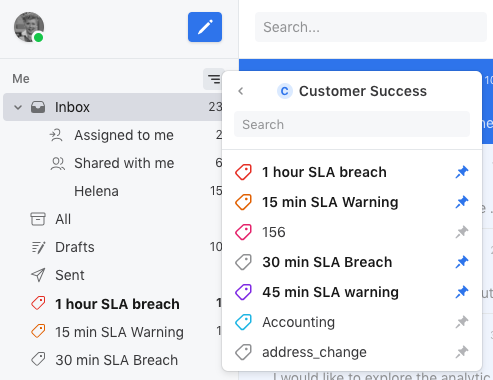 Similarly, in the team section, click the Workspace options icon to change what your team inbox counters mean or toggle which inboxes are displayed. Click on one of the items to see more options, and click the pushpin to add that item to your workspace (clicking on the item itself without pinning will take you to view those conversations). Likewise, you can remove items from your workspace by clicking the blue pushpin again. You can also click the Counters option in both workspaces to adjust the counter you see. To remove any tags from your workspace, you can follow the same steps above, and click the blue pin again to unpin. Cori Morris Cori Morris thanks! This doesn't work. When I click the 3 dots to the right of Team inboxes it only shows the counter settings; there is no option to show or hide inboxes. Ok thanks for this information, I got it to work now. Is it possible to have the counters on each of my tags count only unread conversations rather than open conversations? I'm able to do this for my inbox but not for each of my tags. Thanks! Megan Brown Hi there! Not at this time, but I'd be happy to share this feedback with the team.